We own and operate 33 isolated power stations providing electricity to isolated communities which are too remote to connect to the national grid. 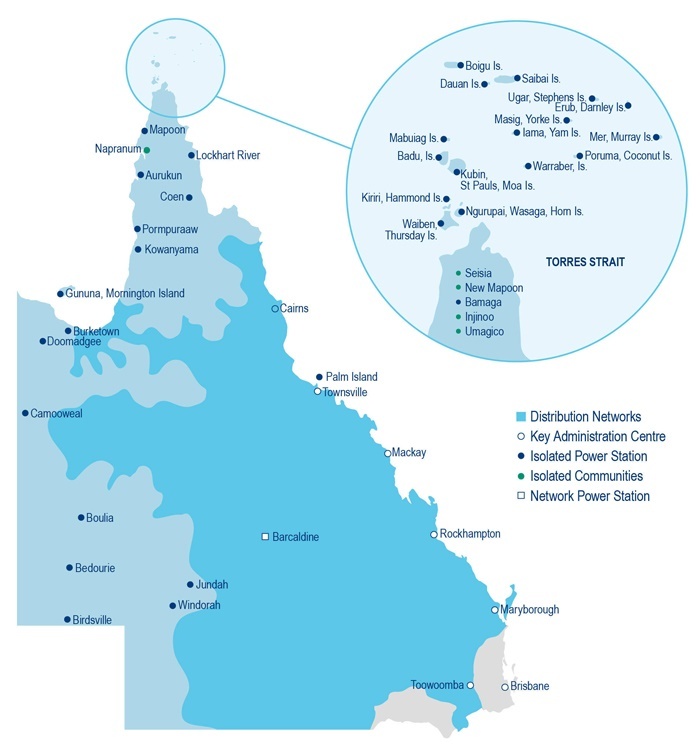 These power stations are located throughout western Queensland, the Gulf of Carpentaria, Cape York, some Torres Strait Islands, and on Palm and Mornington Islands. All power stations use automotive diesel to drive the generators and we're currently investigating alternative and renewable technologies to support them. See our page on alternative generation for more on the types of resources and technologies we're investigating. Read more about these power stations on the renewable energy sources page. The installed capacity of power stations ranges from 260 kilowatts (kW) to 9.55 megawatts (MW). Thursday Island is the largest power station at 9.55MW with the next four largest sites at 1-2MW installed capacity and the rest are in the order of 300-1000kW. Together, these power stations produce approximately 101,000 megawatt hours (MWh) of energy per annum. All stations are monitored remotely and range from having a permanent crew to a part-time power station attendant responsible for basic maintenance.